How can you spend so much time in Japan without ever touching ground in the Ryukyu archipelago? You can’t! Here I am, on a 2 weeks road-trip with Anselme to tackle the islands. This first part is set on the main Okinawa island. The first hours promptly gets us in the Okinawa atmosphere : we’re still in Japan, the care for service is the same, the language –up to a few words, like in any Japanese prefecture- is similar, everything is clean… only, the Japanese people seems different! More relaxed, even totally open-minded about their own turf, they speak a notch louder but, we must comply, they’re friendly and awesome. We really feel comfortable, on vacation. The restaurant chains that usually stand off in Tokyo are seemingly less evident here; however, there are local izakayas everywhere. The happy surprise on this trip is that the local delicacies are excellent. I did expect it, but not that much! The meals have the common bases as those of the mainland, looks pretty much the same too, but the tastes are completely out of this world. Certainly, gōya (bitter vegetable we can find everywhere) isn’t here for nothing : ) Depicting the local cuisine is the chanpurū dish (which the basics contains parboiled gōya with tofu or meat) and it is a good introduction to this gastronomy. Yet I think it’d be mistaken to award importance to this dish which is far less evocative and elaborated than any other dish we’ve tasted. Above is the Tree House Restaurant which we can find approximately in the center of Nara : here the hang-in-the-tree theme can surprise you but the prices are somewhat high and the food isn’t any fancier or better than any places around. And the fact of the matter is… it’s not a real tree. Zannen. The Second World War destroyed most of Naha city, which deeply suffered. Don’t expect to find Meiji or even Edo era ryokans here, old onsens or wooden houses all around… no, it’s a concrete place, sadly, because the island have a long history and there is still some strong Chinese feeling, more than anywhere in Japan. I consider Naha less a destination than a spot from which to access some other places. There is some things to see, but is the city really worth to come to? Frankly, not really. There are so many other things to see in the Okinawa islands and on the main island to only spend your time in Naha. Life here is certainly good but we are hedonist adventurers and we must get over the urban walls. I will bring you to visit some places with us. Below is the Kokusai street (shops, restaurants, bars…). Another difference in Okinawa is the drinks. The vending machines sells some different selection of cans, the common beer is Orion (don’t order Asahi here, even if it’s excellent), and the sake… nihonshu… you’d better get drunk with Awamori (Strong Okinawan sake), or Habushu, its counterpart containing habu (viper)! With this brief Okinawa introduction, let’s now go in a small izakaya to savor some sashimis… and what can we find right in the middle of the plate? You see on the upward left some small bubbles? This is Umibudo : very delicious seaweed best served with some soy sauce. We spent an awesome evening along with Japanese tourists from Kansai. I didn’t expect Naha to be especially bucolic –it’s the Ryukyu Islands capital after all- but I thought it’d be a little bit more idyllic, like some places we can find in Tokyo, relatively attached to the past. Thankfully, Tsuboya district is; so it’s definitely my favourite. Tsuboya (tsubo : pot + ya : local dialect specialist) is the place where all the pottery production of the Ryukyu was centralized in the 17th century. In 1970, everything is relocated to alleviate air pollution caused by the ovens in Naha city. Today, we only find renowned shops, small restaurants and dwellings. I don’t have any specific interest for pottery, but the shops are refreshing, we can find a lot of awesome objects (tough very expensive) and the best of omiyage (gift for friends) are those big shīsā which are used as house roof ornaments. We take a slow-pace stroll, walking on the limestone blocks, following the paths that squeeze through and throughout the heights of Tsuboya. There are some pottery shops where we can stop by and do our own creations. There is also, interestingly, some cute cats wandering in front of a soba restaurant… very cute! Mandatory break. Tough the local soba are, to my taste, a little bit bland, the setting is so heart-warming that we take a halt there without pondering about the time flowing. The curious cats come to see us, and mostly try to mull over our meal; I share unanimously. Naha is mainly constructed with horrible concrete buildings in order to cope with the typhoons (you see the one at the back on the right? ), while Tsuboya neighborhood alleviates the pressure and allows us to live the Okinawa experience while being in this city. We enjoyed our visit. You see, if you’re passing by Naha, Tsuboya is my recommendation. A fabulous spot, quite small, but we can spend hours there, dreaming. We then walk towards the Shuri Castle, former quarters of the royal Ryukyu kingdom. On a 300 meters hill over the sea level, we can have a good view on Naha city. We could swear seeing Arcachon city afar. The overview is stunning with the wavy wall and the blue/green contrasts. The Shuri castle is brand spanking new, very red (sorry, *vermilion! ), and the visitors jostles in. Everything looks overrated, not surprisingly : it has been completely rebuilt in 1996. Its past is troubled because it has been razed 5 times, notably, the last time, by the treacherous Americans during the Second World War. It’s also the biggest wooden structure of Okinawa and we can walk within bare feet. Lovely but somewhat swift, crowded, and something’s missing. It’s impossible to talk about Naha and Okinawa without mentioning the Okinawa war, the last battle of the Second World War. The Imperial Marine underground headquarters has then been the stage of a horrid event, showing a country that lost every hope to win the war. This work is 450 meters of tunnels, hand dug in a short period of time under the American invasion treat. At the end of the war, when everything was lost, the Imperial Marine commander of Okinawa committed suicide along with his 4000 men. We find there rooms with chips of bombshells or grenades, cavities from the bullets; A really dreadful modern mass-seppuku. Here we go. To switch subject, I suggest we eat an Okinawan pizza. We can find them in many izakayas, they’re small but excellent. We’ll have the opportunity to taste another pizza further on. Built in the 15th century, the Nakagusuku castle is the best-preserved one in Okinawa. The fortress was built by the Gosamaru lord to gain protection against the snaky Awamari, who reigned East and attempted everything to take over the throne. Breathe; you’re in the Ryukyu kingdom! The castle consist of 3 citadels, the structure is in an incredibly great shape after such time; Proof that the need of putting concrete everywhere is null. Behind the Nakagusuku castle lies the most popular haikyo of Okinawa : the shell of a giant hotel! It was meant to welcome the visitors to the Expo ’75 but was never completed. It stands off completely from the castle: they are two major ruins that thrive on the same hills but with a completely different style. It’s the first haikyo visit for Anselme and he was really glad. However, I will not detail this haikyo here but you will obviously find it on haikyo.org (my 100% Haikyo Website website) soon. Let’s now go towards Nago, on the northern side of Okinawa island. We find ourselves in Nago vicinity, closer to the beaches, the resorts and the famous aquarium. We find there affordable lodging which the very welcoming owner shows us a point on a map. “Go there, it’s my secret place!”, so we head there on the spot. The place is definitely very quiet, nobody there, no parking, we access this place with a small path in between the groves, but we got told to continue and explore further away than the secret beach. Those are our first aching adventures in the Ryukyu lands. We always think Okinawa as heavenly white beaches but reality is slightly different : the islands are composed of sharp sedimentary rocks (mainly limestone from the coral reefs) that hurt our feet. On another hand, the limestone is efficiently used to build roads, castles and houses and is highly responsible for the Okinawa look. Today, cement is commonly used instead for its solidity and easy maintenance. The limestone was easily crumbling and there was always “habu” (the snake we have in the sake) haunting the walls made out of it. This place is wonderful. It’s a nice rock form we can find in some places on the Okinawan coasts. Many thanks to our host! This recent aquarium (2002) is a pure pleasure. 4 floors of fishes, crazy lighting, everything is elegantly made. I’m generally not very interested in aquariums (I prefer to eat those creatures, whales, dolphins.. : P ), but I was curious to see the “Kuroshio Sea” with my own eyes. 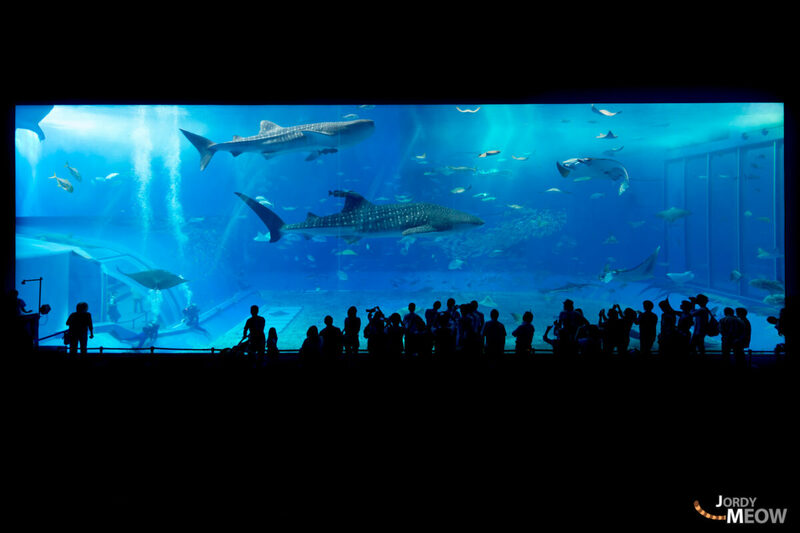 It’s the main aquarium and its dimensions are 22 meters long and 8 meters high. The sight is so beautiful we dare not leave. Believe me, do not think of setting foot on Okinawa without ever visiting the Aquarium! And if you’re in Japan, and you like aquariums, it’s worth it to come down to Okinawa for the weekend only for the Aquarium! Who ever dreamt of eating a pizza in the skies? No jokes! Here we are, the fabulous marketing idea of this pizza shack located on top of a mountain is hard to avoid; and not only for us, but also for all the strangers and Japanese tourists who come here and wait in line. It is quite hard to figure out the way to come here but it looks not to be a hurdle for anybody. After an hour wait (out of season! ), we are settled outside. Everybody is tailor dressed, the weather is wonderful, and the ambiance and the setting is lovely. This is the simplest pizza shack in the entire world : there is only one type of pizza (small or large, 1000¥ or 2000¥) and a salad. The pizza is salami, peppers and garlic. There is no choice to be made except for the drinks. The pizza is very good even if the setting is probably the thing doing it good. More than a restaurant, it’s a nice tourist spot. If you want to go there, it’s here.